It’s cold here. Not Siberia cold but close enough. 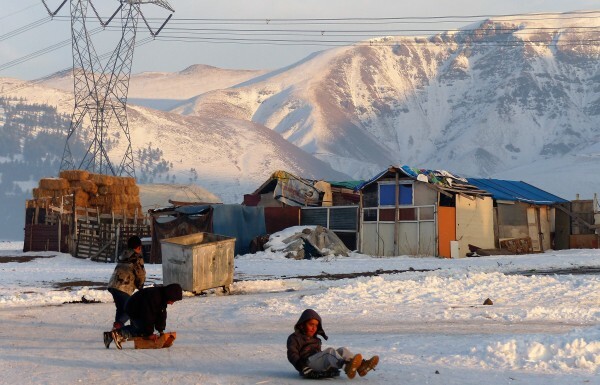 Erzurum is Turkey’s coldest city. In a country known for its beaches and coastline, Erzurum sits in the northeastern corner, equidistant to Georgia, Armenia, and Iran. Four hours north and you get the sub-tropical climate of the Black Sea. Four hours south and you hit the desolate, desert-like landscape leading toward Syria. Erzurum is the cold bridge between, cresting at an elevation of nearly 2000 meters above sea level. Snow can fall here eight of twelve months of the year. But the people of Erzurum aren’t afraid of the cold. I think that’s what makes this place so livable. On the fortunate winter day when the temperatures climb above freezing, people are known to roll down their car windows. In western Istanbul, people lose their minds if snow even makes the forecast. Children are sent to school bundled to the point of immobility. If you don’t do likewise, they insist you’re endangering them with certain illness. Not so much here. People walk downtown in January without even a hat or gloves. I’ve even seen guys skip to the bakery for bread in shirtsleeves when it’s in single digits. Perhaps once you’ve had your nose hair freeze and manage to avoid taking ill you develop immunity to the Turkish old wives’ tale promising sickness from chilly temperatures. Part of dealing with the cold is preparedness. This year the local municipality dug 1800 graves in advance of winter. After the ground freezes, grave digging becomes nearly impossible. One can only hope they have overestimated the need for plots. In town, apartment blocks stock up with advance deliveries of coal. In some apartment courtyards, plastic bags green, blue, and red create mountainous stacks that will gradually shrink over the winter, their contents of rocky coal burnt and transformed into billowing clouds that settle over the city. The sooty haze makes the surrounding white mountains look a dirty brown. The scent of smoke pervades your hair and your clothes even though within the last decade most apartments have transitioned to cleaner-burning natural gas supplied by Russia. 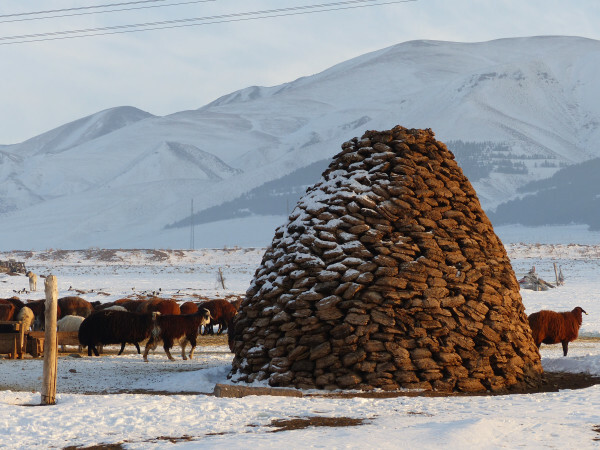 A tezek stack near Erzurum. Outside of the city, in the nearby villages, winter preparedness lasts all summer. Hay is harvested and piled in barn-sized bundles. Barns themselves are often a luxury. Large blue tarpaulin shelters exposed grain from wet snow. Sheep, goats, and cattle will need the store for the long winter. In the villages, where wood is sparse and coal expensive, they burn tezek, or manure, for fuel. All year long villagers collect cow pies or sheep pies, shape them into bricks, then dry them in the sun. The tezek are then stacked in a circular pattern rising into a cone, a shape somewhere between tepee and adobe house. Despite all efforts, sometimes coping is the only solution to the cold, especially when temperatures dive to -30. Diesel can easily freeze in the fuel lines of cars. No matter that some owners blanket engines overnight with old carpets. In such cases, the obvious remedy is heat. Erzurumites have been known to crawl under their cars and light a small fire beneath the engine. This is a delicate balance. Enough fire to thaw the fuel lines. Not enough to melt them. Or worse. Children, perhaps the most industrious of all, have learned how to make the most of winter. Some collect garbage and scrap wood for burning. They bury potatoes in the ground, then build their bonfire above. Thirty minutes later they have a hot potato snack. Not surprisingly, sledding is a favorite pastime. Village kids and poorer children create makeshift toboggans out of cardboard boxes, wood pallets, even plastic grocery bags. The more adventurous ski down the streets, standing upright on improvised curtain rods. I’ve had to dodge streetskiing children on multiple occasions while driving uphill on ice. 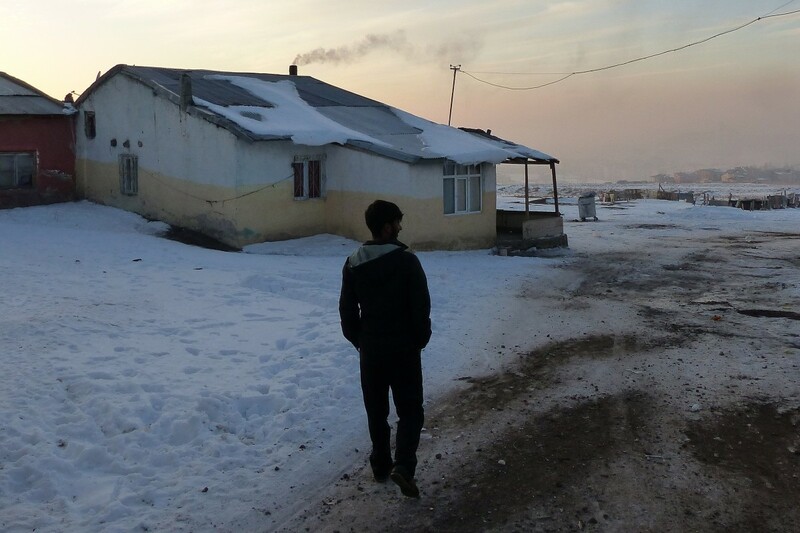 The cold does take its toll, even if the people of Erzurum have learned how to handle it. Every year residents die from icicles falling from overhead. A meter-long javelin of ice falling from a six story apartment doesn’t leave much in doubt if it lands on target. Because of this, most pedestrians avoid the sidewalks. As you can imagine, this means more people to dodge. Cars spin and slide down snowy streets. Pedestrians do the same. Erzurum’s regional hospitals are full all winter long. The aging don’t respond well to the bitter cold. Thankfully the hospitals here have a helicopter. They even have off-road ambulances equipped with tank treads. My elderly neighbor is picked up and dropped off by a special ambulance transport in the winter since she can’t make it on her own in the family’s aging and often-frozen Hyundai van. The people in this part of the country understand full well the dangers of the cold. One hundred years ago, in 1915, the Ottoman Turkish army was engaged with Russia during World War I. Not far northeast of Erzurum, the Battle of Sarkam was perhaps the darkest moment in the war for Turkey. Some estimate the Ottomans incurred 70,000 casualties, many of them lost to exposure while hemmed in on snowy peaks. These days, tensions with Russia and Syria have put the citizens of Turkey back on edge. People on the street are quick to talk foreign relations. The question everyone is asking: Will Russia strike Turkey? In Erzurum, the obvious second question is: Will Russia cut off our natural gas? But the answer is always the same: It doesn’t matter. We can make it through winter without gas. We can always burn our tezek. Brian McKanna is a contributor to EthnoTraveler and Nowhere Magazine, where he recently wrote about refugees.